Russia is one of the few European countries to keep a crafts – ремесло (remeslo) industry very much alive. This activity, developed on a large scale in the nineteenth century, has continued to flourish through the years without losing its authenticity. 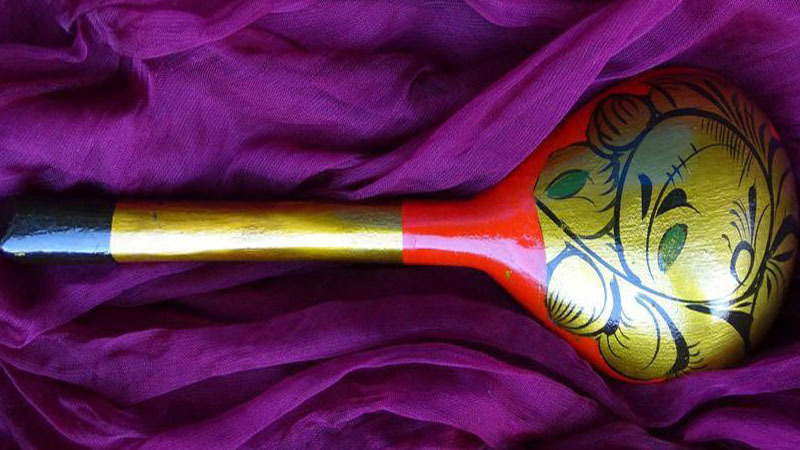 One can find some of these handcrafted objects – предметы (predmety) in museums, but in reality, they are still used daily by Russians. Luckily, the most emblematic places where these objects are manufactured – производство (praizvodstva) are close to Moscow and can be easily visited. However, please note that prior booking – предварительная запись (predvaritel’naya zapis’) for your visit is often mandatory. The serving trays from Jostovo – жостовские подносы (zhastovskiye padnosy) are metal – метал (metal) plates lacquered in black or red, and flowers – цветы (tsvety) or berries – ягоды (yagady) are painted on in bright colors – яркие цвета (yarkye tsvieta). There are different sizes – размеры (razmery) and various shapes – формы (formy). Jostovo is a village about fifty kilometers north of Moscow. The factory houses a museum and organizes visits – экскурсии (ekskursii) and master classes – мастер-классы (master-klassy), workshops for children and adults. 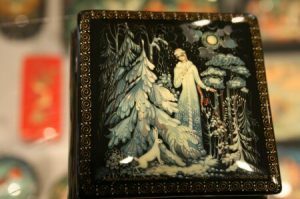 Where to keep m’lady’s jewelry, if not in a Fedoskino – федоскинская шкатулка (fedoskinskaya shkatulka) jewelry box? Fedoskino – Федоскино (Fedoskina) is not far from Jostovo, approximately fifty kilometers from Moscow. The real boxes are made of paper-mâché – папье-маше (papye-mashe) that is covered with several layers of lacquer and are black on the outside and red on the inside. 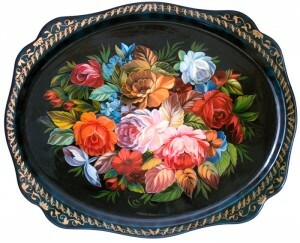 The lid has a miniature drawing – минятюра (minyatyura) that is hand painted – ручная роспись (ruchnaya rospis’) and signed by the artist – художник (khudozhnik). The miniature drawings illustrate different Russian fairy tales – русские сказки (Russkiye skazki) and their magical worlds, or the landscapes of the Russian winter – русская зима (Russkaya zima) and its sleighs – сани (sani). It was in the late 18th century that a manufacturer of military caps having been in Braunschweig, Germany, brought the technique of making paper-mâché to his town. Then the manufacture of snuff boxes – табакерки (tabakerki) with an image on the lid began. The boxes as we know them today first appeared in the second half of the 19th century. The two other major manufacturing centers of lacquered boxes are Palekh- Палех (Palekh) and Mstiora – Мстера (Mstyora), two towns located between Moscow and Nizhny Nogorod, and not far from Suzdal and Vladimir. 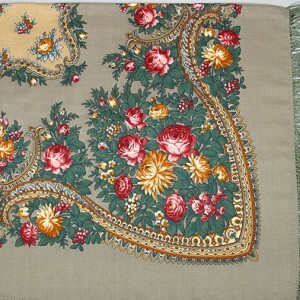 “The flowers of Russia are on your shoulders!” – Цветы России на ваших плечах (‘Tsvety Rassii na Vashikh Plechakh‘) is the motto of the factory of shawls in Pavlovo Posad – Павловопосадские платки (Pavlavapasadskiye Platki), about 70 km from Moscow. These woolen – из шерсти (iz shersti) shawls with wool or silk fringes – из шелка (iz shyolka) are wearable Russian business cards. Worn daily by Russian women, they create the best effect in theaters in Paris, London, or Sydney. The factory does not have a business office that organizes excursions, but it is still possible to arrange a visit through a tour operator in Moscow. One can also simply visit the museum, which features old and rare shawls. 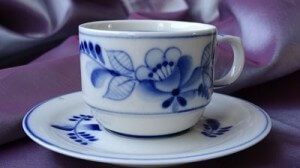 The white and blue porcelain – фарфор (farfor) of Gzhel – Гжель (Gzhel’) as we know it today first appeared in the early 19th century. The name ‘ceramics’ comes from the place where the craftsmen have manufactured ceramics – керамика (Keramika) since the 14th century from a white clay of excellent quality. The appearance of this porcelain from Gzhel with blue lines on a white background is reminiscent of Chinese porcelain or the famous Delft pottery. This art, in decline at the time of the 1917 revolution, was intensely developed during the Soviet era. Today, in the village of Gzhel, about sixty kilometers south of Moscow, they continue to produce not only typical Russian figurines of bears – медведь (medved‘) and the Baian, that is, accordion – баян (Bayan), but also clocks – часы (chasy) and even sinks – раковины (rakaviny)! Several factories of the Ramen area, where the village of Gzhel is located, offer tours. The Gzhel State University, which trains teachers – мастер (Master) in the art of Gzhel porcelain-making, is located 70 km from Moscow in the village with the cool name of Élektroisoliator – Электроизолятор (Elektraizalyatar), and offers tours of its museum and master classes. Located a little further away but very accessible for CREF’s students in Nizhny Novgorod – Нижний-Новгород (Nizhny Novgarad), one can discover the secrets of the dishes made of lacquered wood from Kokhloma – из Хохломы (iz Khakhlamy). A varnish – пищевой лак (pishchevoy lak) that is safe for food is used, and these varnished dishes are not only used at special occasions, but even for daily meals. One of the centers of production of these artifacts from Kokhloma is located eighty kilometers north of Nizhny-Novgorod, in the village of Semenov. It is possible to attend the festival – фестиваль (festival’) which takes place every year in June, as well as many other events – мероприятия (merapriyatiya) throughout the year. If you need help organizing an excursion to any of these destinations, please do not hesitate to contact our partner Tsar Voyages – Царь Вояж.